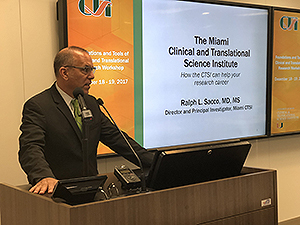 The Miami CTSI hosted its annual Foundations and Tools of Clinical and Translational Research Workshop on December 18 and 19 to give early stage faculty, fellows, post docs and students an extensive overview of the translational research being conducted by some of the University’s most successful investigators. More than 30 people attended the two-day educational workshop, which featured a mix of didactic lectures and interactive panel discussions highlighting research thematic areas of cancer, neuroscience, emerging diseases and innovative therapies with cross-cutting perspectives of informatics, population health and health disparities, precision medicine and team science. Attendees were also provided important information on the research processes and resources available at the Institution. Chaired by Tatjana Rundek, M.D., Ph.D., Director of the Masters of Science in Clinical and Translational Investigation, Executive Vice Chair of Research and Faculty Affairs in the department of Neurology and Professor of Neurology and Public Health Sciences; and designed by Richard Bookman, Ph.D., CTSI Sr. Advisor and Associate Professor of Molecular & Cellular Pharmacology, the goal of the workshop is to provide an introduction to clinical and translational science at UM. Opening the workshop was Dushyantha (Dr. Jay) Jayaweera, M.D., Senior Associate Dean for Research, who outlined the Miller School’s vision of research in the new research strategic plan. The plan, Dr. Jay said, is a guide for excellence, innovation and integration in strengthening and developing clinical and investigational programs. Miami CTSI Director and PI, Ralph Sacco, M.D., followed next and emphasized the ways the CTSI advances clinical and translational research through its programs, educational and training activities, services, expertise and awards that support the careers of young investigators and clinical research professionals. Throughout both days, top investigators gave exciting presentations on their breakthrough science, career trajectories and provided advice on mentoring, collaboration and key tools for success. Taking the workshop further, the Miami CTSI Master’s of Science in Clinical and Translational Investigation offers formal training in translational research. The 30-credit program is open to academically-qualified students from all research backgrounds that are pursuing a terminal degree program or have completed a terminal scientific or healthcare degree. For more information about the master’s program and to apply, visit www.miamictsi.org/education/masters-program.